The spine is quite literally an epicenter of our well-being, providing the body with the support it needs to stand upright and to bend and twist, all while protecting the spinal cord—the super-highway through which every nerve signal passes, carrying instructions for our daily physical operations. In the absence of pain signals, it is easy to take a well-performing spine for granted, that is until you experience a twinge, or a pinch, or a bring-you-to-your-knees stabbing pain. As a matter fact, if you are running, jumping, or swinging your way through life, or more specifically through mid-life, thank your lucky stars, because the aging process alone makes it highly likely that you have some degeneration in your spine; you just don’t know it. When spine health is compromised, quality of life can be greatly diminished as movement may become painful and severely limited. Made up of 33 small bones, called vertebrae; stacked one on top of the other forming the natural curvature of the back, each vertebrae is separated by flexible discs, constructed much like a jelly-filled doughnut, with a solid but flexible outer ring surrounding a gelatinous center that acts as the spine’s shock absorbers. When something goes awry in this complex structure, it is the highly concentrated nociceptors, located on the back part of the spine, that pick up the pain, signaling for help, said spine specialist Dr. Charles J. Nivens. By the time Dr. Nivens sees a patient at his Bluffton practice, they are often already in a significant amount of pain. “It’s all about trying to get the inflammation under control,” he said. “My role in life is to keep people out of surgery. It’s my passion” (a fact that may come as a pleasant surprise to many who may have avoided treatment with the belief that surgery will be their only option). “A relatively small percentage of the population actually needs spine surgery.” Inflammation drives pain, however, with the procedures available today, most pain can be reduced or eliminated without going under the knife. A course of treatment with Dr. Nivens typically involves three components: 1) An accurate diagnosis; 2) an injection of steroids; and 3) a course of physical therapy. “It’s all about the detail of the diagnosis, the accuracy of the diagnosis, and the accuracy of the injection,” Dr. Nivens said. 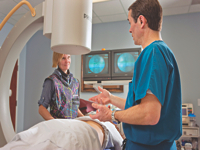 That accuracy is now achieved nearly 100 percent of the time with the use of fluoroscopy (x-ray guided selective injections) and dye, to insure the injection goes exactly where it is needed. Once the pain is under control, rehabilitation begins. “Rehabilitation is a very important part of my practice; having the patient really more involved with their spine, more so than I am or anyone else,” Nivens said. Dr. Nivens and his wife Ingrid, a former physical therapist, opened their spine health practice in 2000, with the belief that they not only have to be good at what they do, but that given their individual situation, the patient must have as good an experience as is possible within the practice. Dr. Nivens’ journey to medicine began just out of high school with a four-year tour as a corpsman in the Navy. As a medic he became an ear, nose, and throat technician and realized he had found his calling in a profession that would be encouraged by a series of mentors who believed in his desire to not only treat the patient, but make the experience more personal. Dr. Nivens says that directly connecting the patient’s story with their test results is the most effective way to prescribe a successful course of treatment and rehabilitation and to develop important personal relationships. “I’ve been seeing some of my patients for over 10 years. We’ve grown up together and grown older together. I know them and their families. It’s interesting how many friends I feel I have within my practice. I hope they feel the same way. I think they do,” Dr. Nivens said. 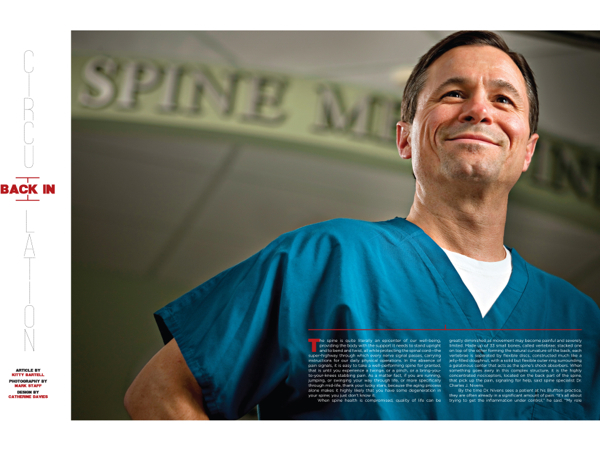 Dr. Charles J. Nivens – Spine Medicine is located at 3 Plantation Park Dr., Bluffton. (843) 705-7471 or (877) 238-2013. For more, please visit nivensmdneckandbackpainspecialist.com.